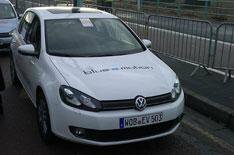 Volkswagen Electric Golf | What Car? To all intents and purposes, this is a standard Golf. There's a little less boot space because of the battery pack, a couple of different dials to reflect charge levels and - most notably - two flappy paddles behind the steering wheel, which can adjust the level of automatic brake regeneration. Driving the Golf is simplicity itself. There are two forward settings, one that allows free progress, the other maximises energy regeneration opportunities under braking. Both ways of driving take seconds to get used to, but would take several hours behind the wheel to get the maximum out of. The same can be said of those flappy paddles behind the steering wheel. There are four settings, each applying increasing amounts of braking to instigate energy recuperation when you stop accelerating. Used cleverly they make a significant difference to efficiency, but getting the best from the system requires a lot of thinking ahead, reading the road conditions and working the paddles hard. In everyday driving, as opposed to a competition such as the RAC Future Car Challenge, it is easy to think they could get ignored unless you are running out of range. Overall, then, this car supplements all the Golf's qualities with improved refinement - obviously there's no engine noise, just a tiny whir from the electric motor, and wind- and road noise are minimal, plus amazing efficiency. Driving with economy in mind, but being no eco expert, I managed to hit exactly the claimed maximum mileage, so VW's range claims are realistic. It's also fun to drive if you are willing to sacrifice range: it has enough torque to spin the wheels if you must. Come 2013, car buyers who can live with the inherent range compromises are in for a real treat.